A few summers ago, the Bark at the Moon Coyote Club ventured to South Dakota on a Prairie Dog Safari. They also packed a video camera and captured tons of exciting footage! 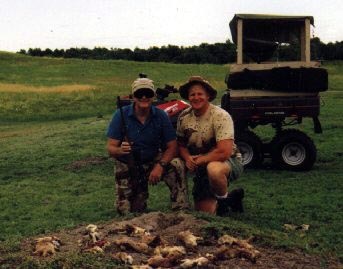 Two hunting trips of non-stop hunting action have been compressed on this fantastic DVD. Lots of great info included! - Lots of true hunting action!! If you want to see over 200 hits on film, this DVD is for you. See how the BUCKSNORT PRO STAFFERS shoot at distances ranging from 15 yards to 500 yards... with amazing profiency. WARNING: This is a home made video that is intended to be viewed by hunters. Some folks may find the "kill shots" to be offensive. Although the footage is quite awesome, It sometimes shakes and quakes from the wind and the excitement of the hunt... ENJOY!! !